Recommended Retail Price: £18.50 for the 2/3 person or £22 for the 4/5. 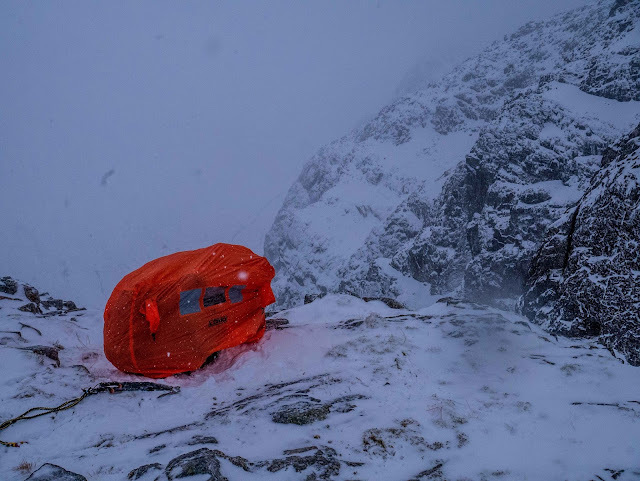 The LOMO Bothy Bag is aimed at being an emergency shelter which is stored at the bottom of the bag and generally only pulled out in emergencies or for a sheltered stop when conditions are really tough. As such, a bothy bag needs to be light, low volume as to occupy a minimum amount of space in the bag and ideally cheap as it isn't used very often. The 2/3 person bag weighs in at 360g (363g on my kitchen scales), has a stored size of 21cm long by 10cm and costs £18.50, therefore, satisfying these three criteria well. Obviously, some higher performing bags are in existence such as the MSR Munro bag (370g), the Terra Nova Superlite Bothy (253g) and the Rab group shelter (320g) but costing £90, £100 and £40 respectively, the LOMO bag wins on the value for money front without sacrificing very much with regards to the other criteria. 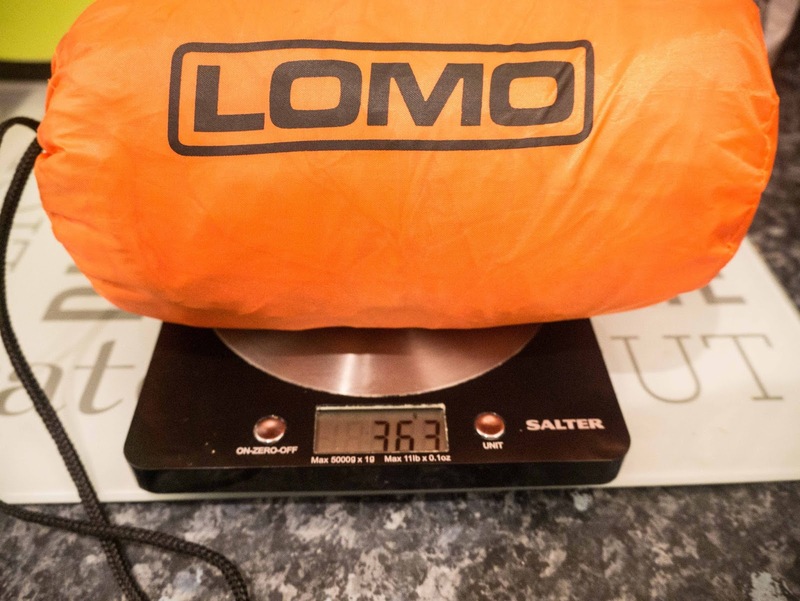 With regards to performance, there are various things we really liked about the LOMO Bothy Bag. Firstly, the bothy bag features large reflective squares which are not present on any of the other bags we are aware of. This appears to be a significant shortfall by other manufacturers and it's nice to see LOMO address it. As emergency shelters are likely to be used in emergencies and emergencies will sometimes (even often) occur after dark, a large reflective strip makes it much easier for rescue parties to find the shelter. The other feature we enjoyed with the latest version of the shelter is the sealed seams, the fabric performs well against water so it's a very nice and simple feature which will ensure the occupants stay dry for a longer duration. Even with this being a 5-star product in our opinion, there are some shortfalls. 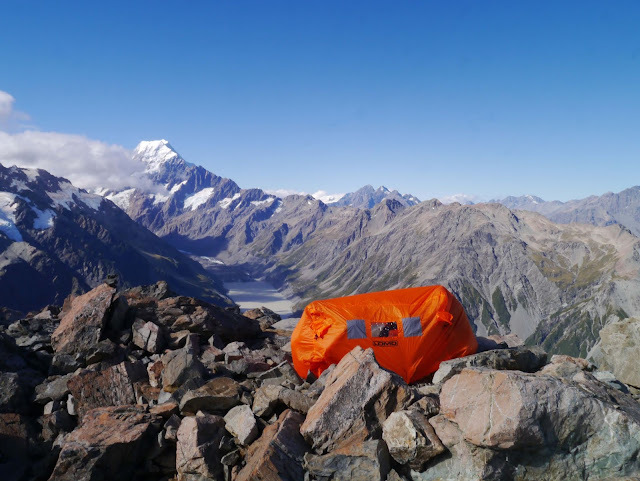 The only real shortfall we identified, however, is that the bag is not particularly great at fulfilling its role of being a 3 man bothy bag. Although it is stated by the manufacturer that 3 can be fitted in at a squeeze (i.e. in an emergency), we struggled to replicate this. We are happy to accept however that having 3 guys over 6ft trying to squeeze in is maybe not the best test but it would be the likely situation in which we would have been using it. It is also noted that crampons have to be removed if you are wanting any chance of achieving this without perforated skin! The same is true of the 4/5 person bag, ideal for 4 but a bit of a squeeze with 5. Things we like: Value, Reflective Strips, Sealed seams. Things we don't like: Not particularly suitable for the upper limit people.